Having thoroughly explored the ruin with Ranger Bill, our awe and wonder were at a peak. The slow trudge back to the campground allowed us to compare notes; impacts on us were profound. Exhausted by what we’d done, humbled by what we’d seen, rest and food and sleep were all we wanted. I vaguely remember quinoa and yummy sauce, raw veggies, lots of water to rehydrate, and crawling into our sleeping bags just after sunset in anticipation of a pre-dawn hike out. I couldn’t sleep. Sleep is for darkness. My mind was churning with the history of these people, the artifacts they left behind, the stories surrounding every room block and metate and pottery shard. Late that night as the moon began to rise, my body eventually came to terms with the lumpy soil beneath me and the open sky above me, and I dozed lightly on my tarp until after midnight. 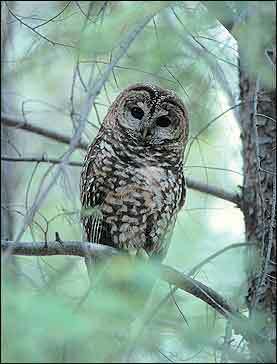 Google image of Mexican Spotted Owl, same species as hooted at me in Tsegi Canyon. Hoo-hoo, hoooo. My eyes flew open. A crow-sized bird sailed silently over me, his silhouette visible against the stars. Hoo-hoo, hoooo. Again. Strong, resonant. I knew what this was — an owl I’ve been hoping to see for three years. A threatened species, with only 2100 individuals remaining in the United States. And here, in this remote canyon in Arizona, a lone Mexican Spotted Owl (Strix occidentalis lucida) woke me up to give me the delight of hearing its voice. I was beside myself with joy. Keet Seel ruin is perched atop a ledge five stories above the canyon floor. Only the northern part is visible in this photo. Keet Seel is OLD; pottery shards and tree-ring dating show evidence of occupancy since 950 A.D. Those early houses are gone, but a few timbers were re-used in the subsequent village. In 1272 the ancestral Puebloans deemed this rich wet canyon suitable for a massive building project. At its height, 150 residents occupied the glorious alcove — likely from two different language groups, unable to understand each other but sharing an intimate neighborhood. 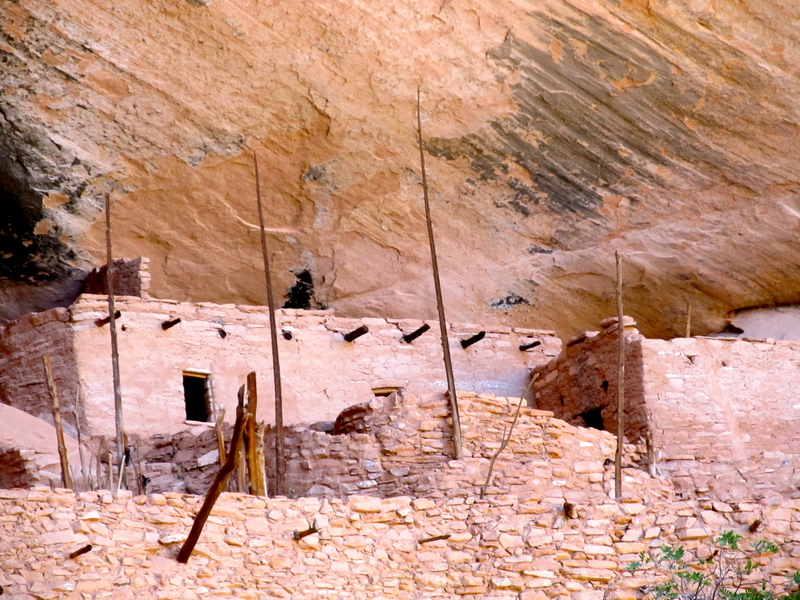 The care and artistry with which the village is laid into the rock space reflects the ancestral Puebloans’ ability to meld form and function. The alcove and its structures are inextricably unified, sandstone on sandstone, masonry on aeolian dunes, seamless. Ancient architects hung buildings on the bones of rock, suspended on slopes, fixed in place by unseen forces. Keet Seel ruin is full of life and mystery. An everyday cooking vessel sits silently in the ruin. In every direction, my eyes land on evidence of the ancestral Puebloans’ occupancy — at times so fresh, so present, that it is as if these people just picked up and left recently. 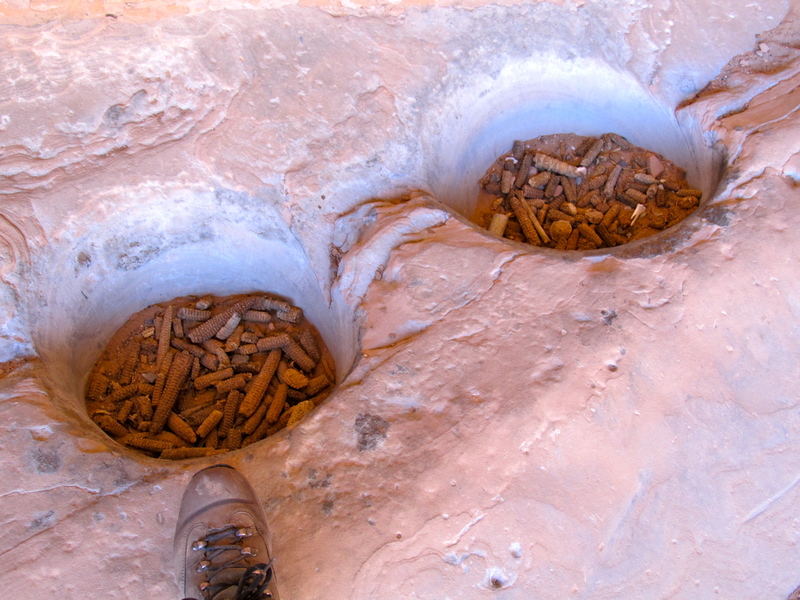 Ancient corn cobs fill the stone depressions that may have served as part of the grinding process. Ancient shrunken corn cobs fill stone depressions which were likely used for knocking the kernels off to be ground; I can see the womenfolk hard at their task with metates and manos. A shapely vessel adorns the top of one wall, recovered in pieces and cemented back together; I can see girls filling it with water. Down in the kiva, fiber loom anchors are attached to the floor; I hear the men gathered there, weaving blankets, talking about their latest hunting escapades. 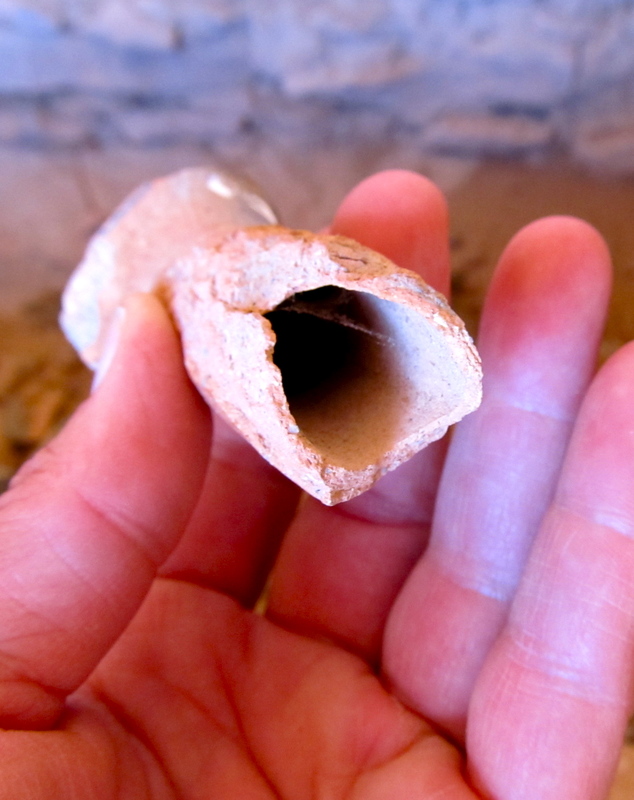 Hollow pottery handle from a dipper or ladle adds intrigue. A broken dipper handle, hollow, hallowed, sits upon a pile of stones; thirsty children drink from the spring. 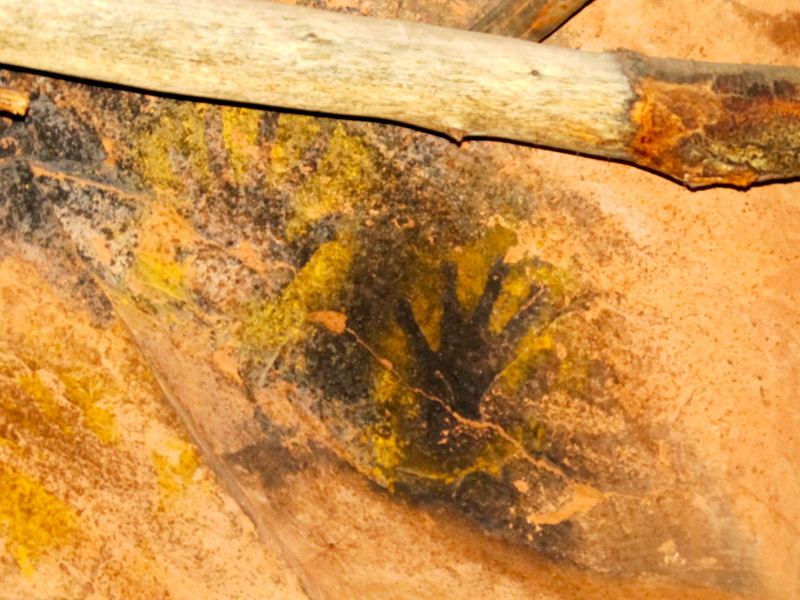 And, in one darkened room block, our camera flash reveals distinct painted handprints on the wall — intimate touch of its residents 750 years ago. Rough-hewn beam ends, ceiling timbers shaped by stone ax, project from rock walls. 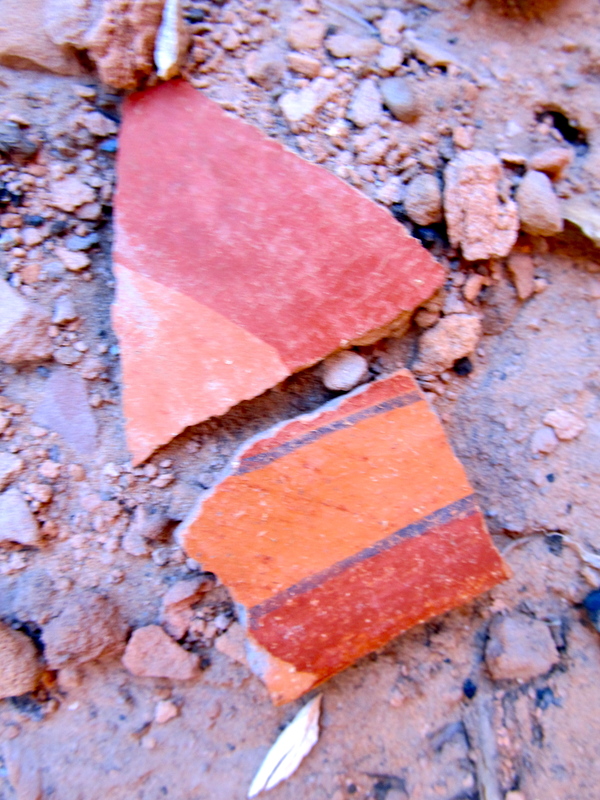 Pottery shards everywhere speak of the artistry and aesthetics of this culture. Every shard reflects the artistry of its maker. They covered the ground underfoot. One can see the ax marks on this beam. 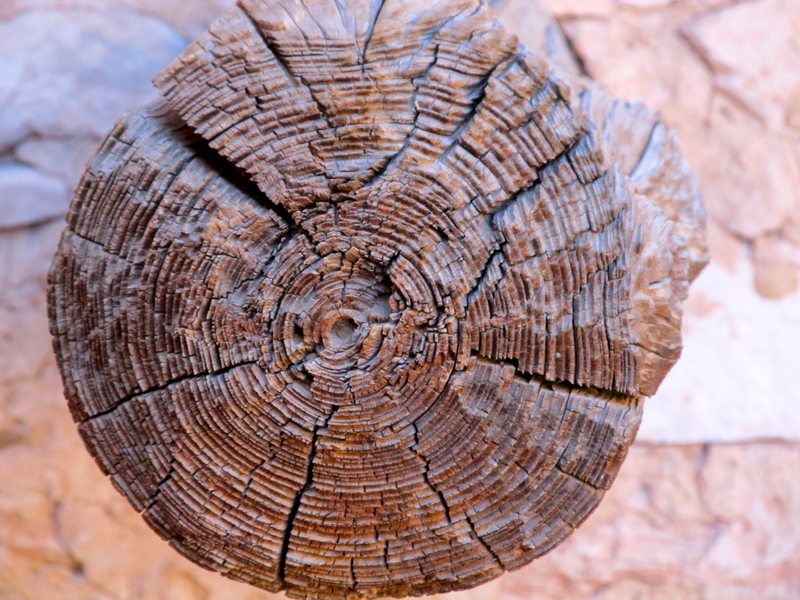 Dendrochronologists can tell in what year it was felled by comparing it to known tree ring patterns. Black and yellow paint highlight hands of the original residents. The yellow pigment was blown through a straw-like reed to make the negative print. The ruin is so intact that I have no difficulty imagining its occupants in their daily lives. Just look at that beautiful street! The ability to sense when you’re getting close to your destination helps when you’re bone-weary, which we three were. Ascending the final hill to the primitive campground, we found an open site and dropped our packs. Ground-cloths were spread and late lunch happened. The lure of horizontality couldn’t be overcome; we rested under the oaks in sight of our prize — Keet Seel Ruin. If you’ve never seen a huge sandstone alcove, it’s difficult to comprehend the feel of the space. Organic, protective, curvaceous, smooth, empty, inviting — the ancestral people felt its attraction. When one of these magnificent spaces is filled from end to end with a village, my heart and mind are electrified with connection. 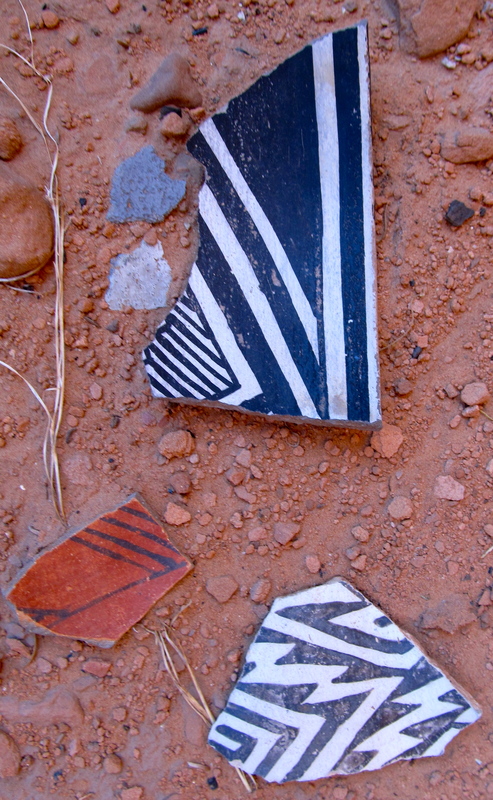 Polychrome pottery fragments — such lovely colors are mixed in among more common black-on-white shards. 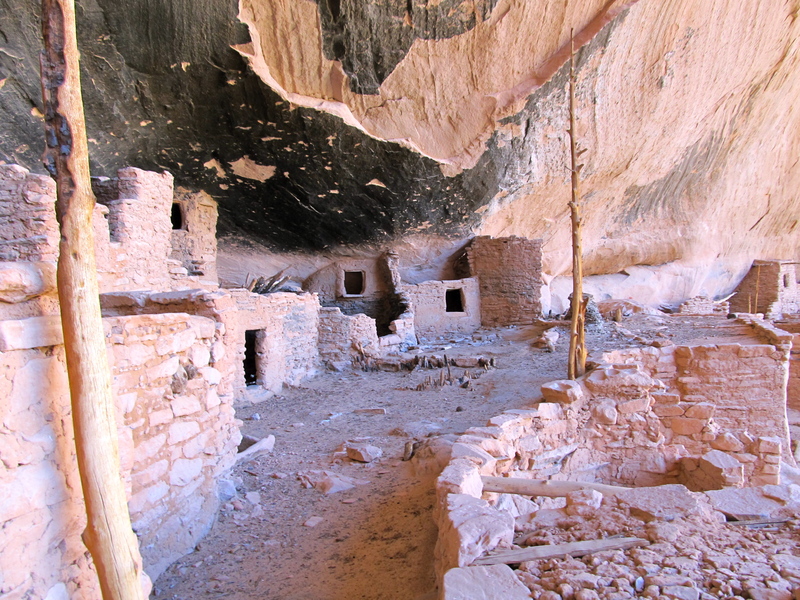 Approaching the ruin with quietness and respect, we met Bill, a park ranger of Navajo descent. He guides only five people at a time through the 13th-century cliff dwelling, after the approach past thousands of breathtaking pottery shards and a climb up a five-story ladder. 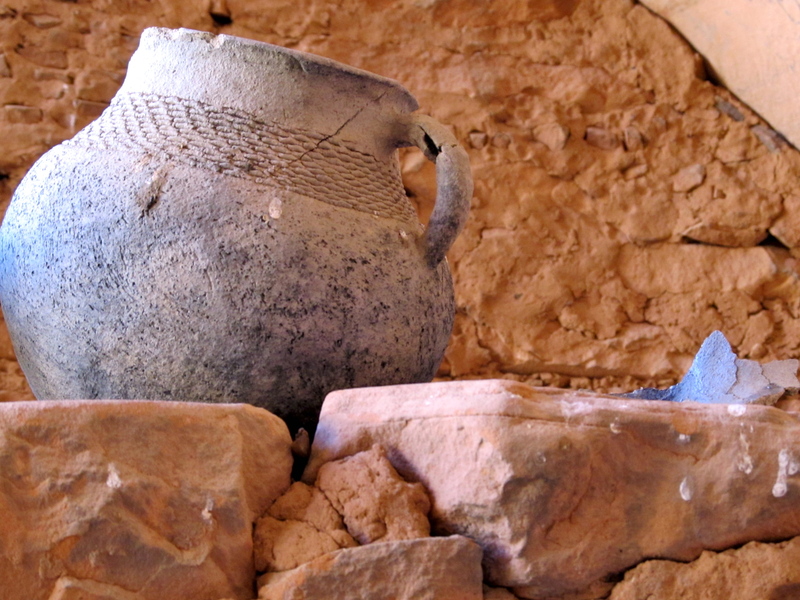 “Broken pottery scattered around” is Keet Seel’s rough translation in Navajo. I gasped at the quantity and size of the pieces and scrambled up to enter the ruin. The ladder is not for the faint of heart. 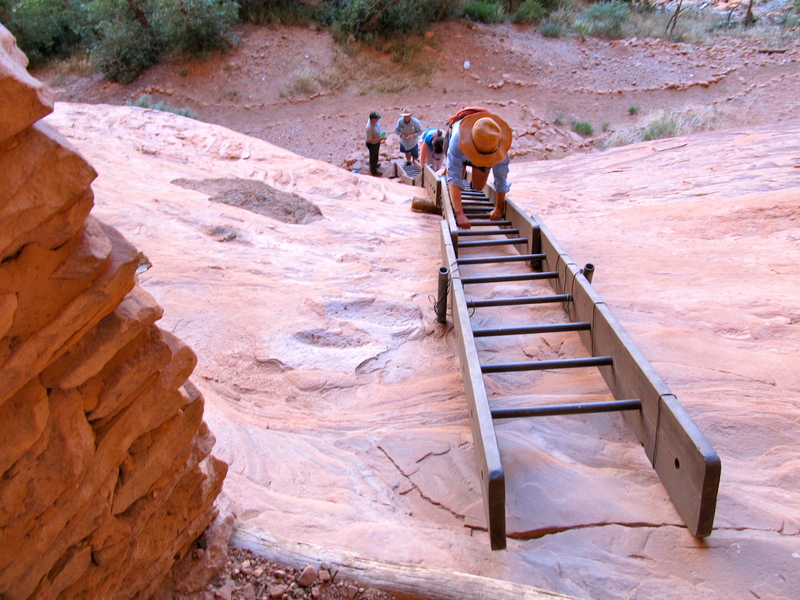 Ancestral people used less sturdy ladders, and sometimes moki steps (footholds and handholds) carved into the rock. A masonry retaining wall running the length of the alcove presents a strong visual boundary; behind and upon it the people laid out three streets. Streets! Places of commerce, greeting, gathering, moving about, exchanging conversations — I’d never seen such streets in a ruin before. This, however, is no ordinary ruin. I feel weightless on the cusp of adventure. The pack, however, is another story. In the pre-dawn chill at 7300 feet, our sleeping bags held us captive as we contemplated the two-day adventure before us in Navajo National Monument. Arizona’s finest ruin had been on our radar for a month; team Tara/Margretta/Kathryn was perched at the ready. Now we had to carry full backpacks 8.5 miles (and back) to earn the privilege of exploring this ancestral site that could be visited only with a permit and a ranger. We rolled out of our bags, greeted the just-lightening skies, and got busy. Margretta and Tara, hydrating in the desert. Strong, beautiful women. 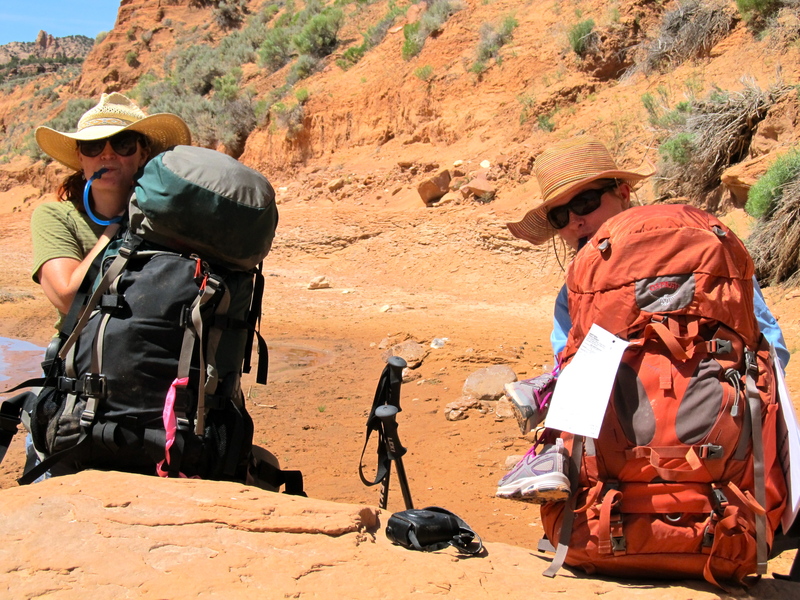 All-important permit is attached to Tara’s pack. Contents of pack: two gallons of water per person in the summer sun (that’s sixteen pounds of slosh) plus food for three meals, sleeping bag and pad, clothing, footwear, toiletries, backpack stove and tent. To lighten my pack I elected to forego the tent and sleep on a small tarp. Still, hoisting that weight onto my back was a reminder of how much I ‘need’ in my everyday life. Dropping a thousand feet down switchbacks, I cached two liters of water at the bottom for tomorrow’s climb out, and we began following a meandering perennial stream that would be our guide. 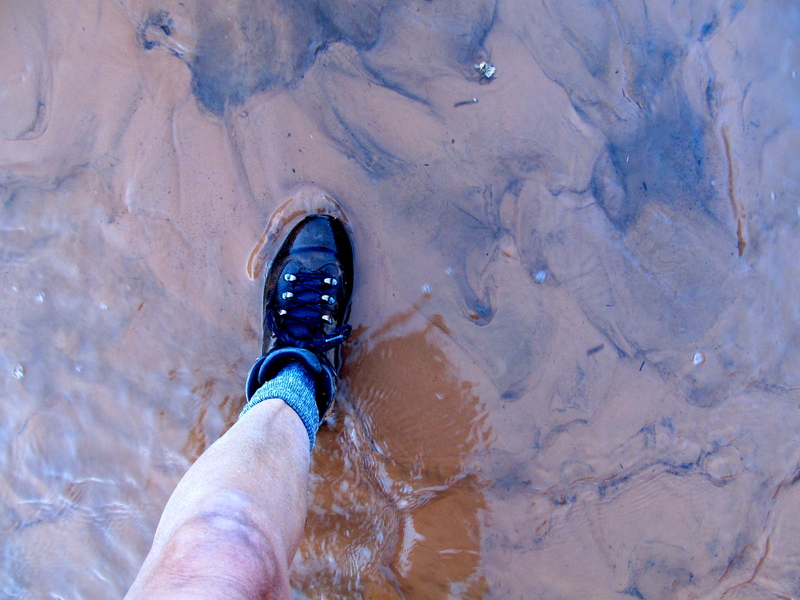 Thirty-two times we waded through 1-3” of spring-flow that morning, glad for Gore-tex boots. Shade was absent, but camaraderie plentiful — adventurers lured by twin siren songs of exploration and long-gone cultures. Numerous stream crossings added interest to the hike. Park Service boots kept my feet dry. 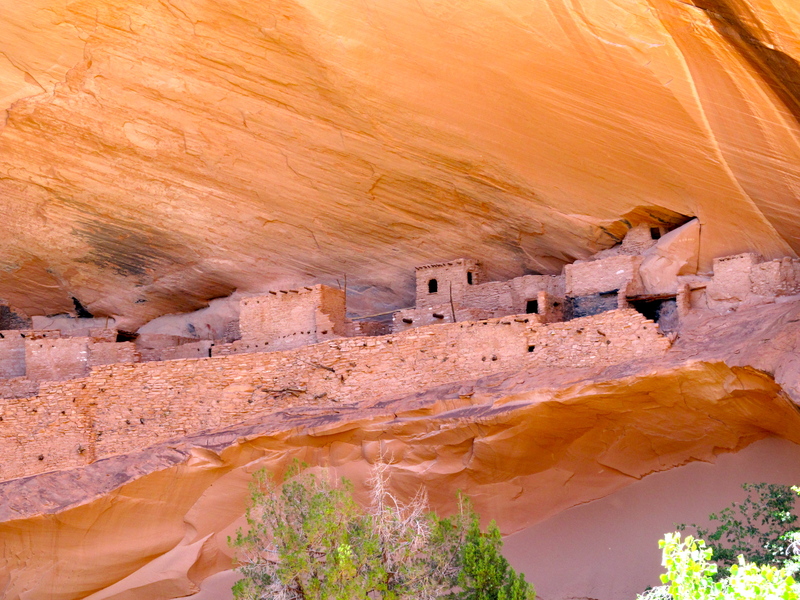 Mile by mile, the canyon gradually narrowed and became even lovelier; with the dependable water source, I had no difficulty imagining why the ancestral people chose this site for cliff-dwellings in the thirteenth century. My mind could not have conceived, however, the marvels that lay ahead. 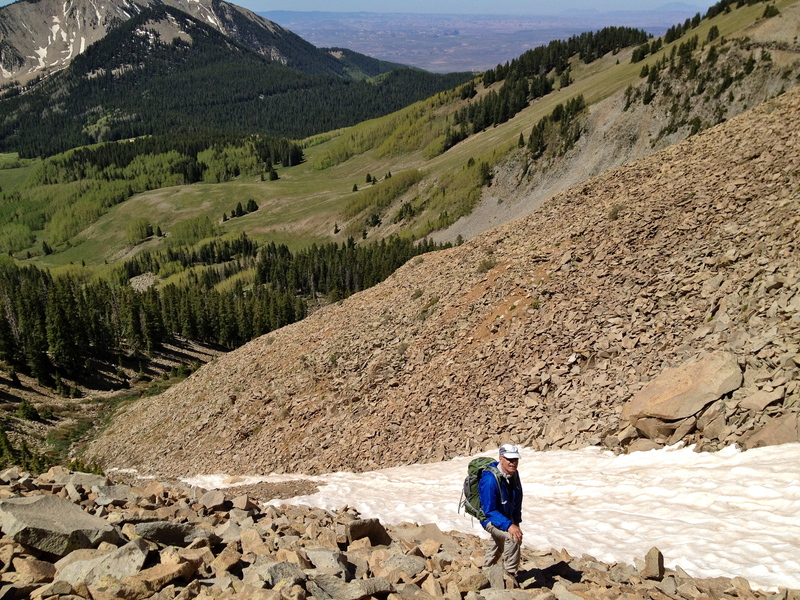 Ranger Chris, determined, tries to skirt the snowfield. This is the couloir that stopped us. Angle of repose for granite is 35-40 degrees, and it is steep and unstable. My hiking partner’s the safety officer at work, and he takes his duty seriously. We conferred. 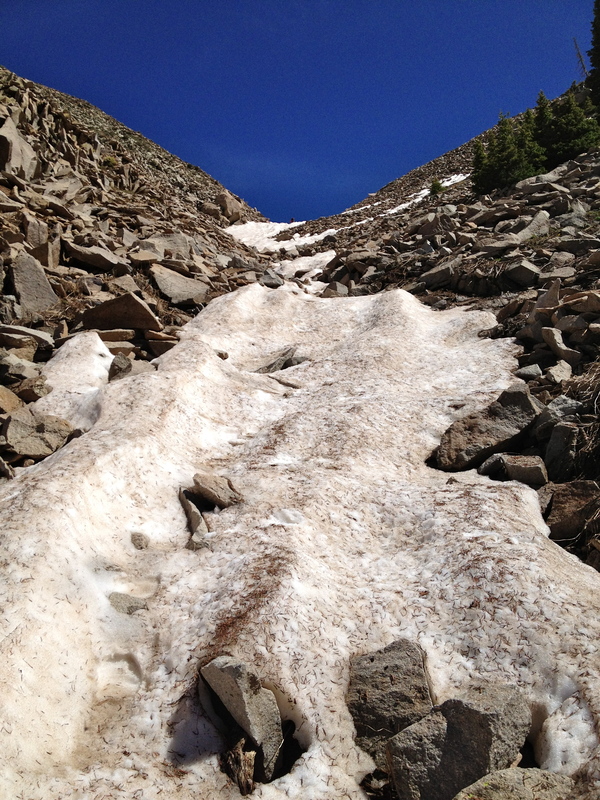 Without ice axes, there’s no way to arrest one’s slide if footing is lost; you’d end up at the bottom of the couloir crumpled around granite boulders. The mental image of a mangled body deters us; concluding that the wisest route was down instead of up, a postponement seemed the appropriate choice. Mt Peale, you win this round — but August is coming. We’ll be back. Mt Peale: TALL. Ranger Kathryn: SMALL. 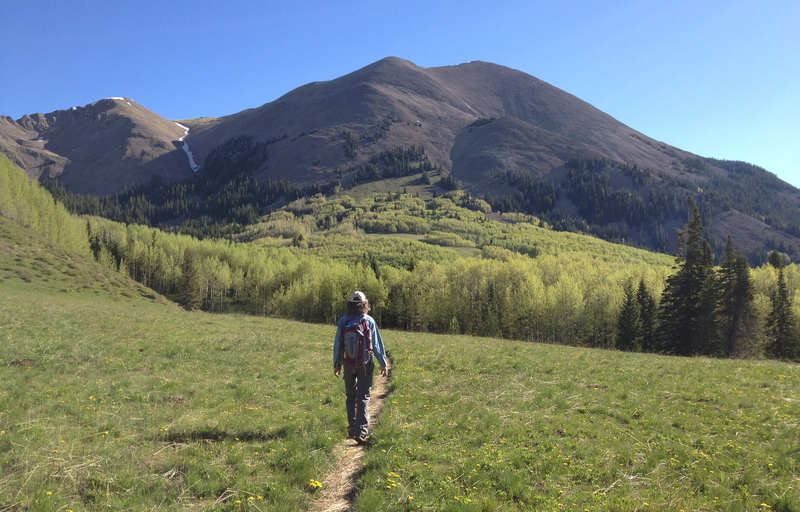 The highest peak in any range beckons to be summited, and Mt Peale in the La Sal Mountains is no exception. 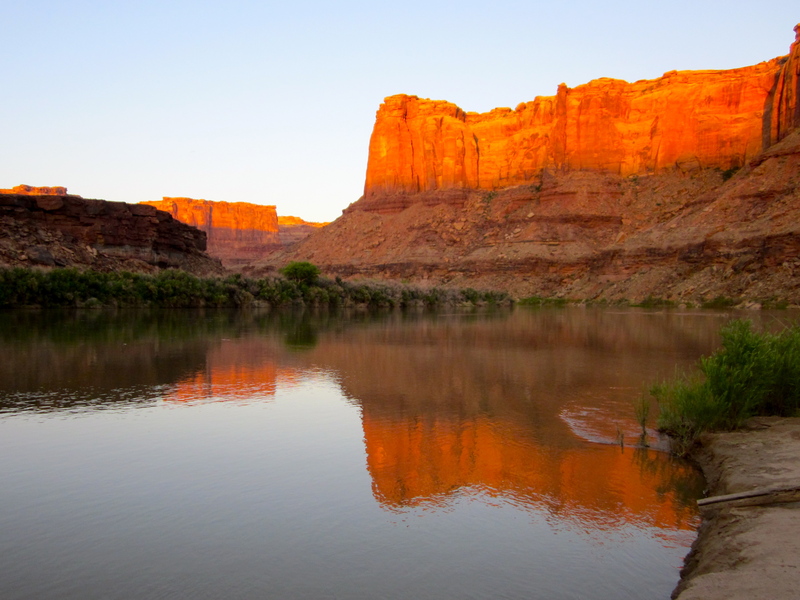 Standing watch over Moab, currently 99 degrees hot, it holds the promise of adventure — and pleasant temperatures. Ranger Chris and I head up the winding Forest Service road to camp at 10,000 feet, where my Prius seems out of place as we pass nothing but ATVs and 4WD vehicles. The eyes on the aspens watch the hybrid car, puzzled, as she demurely navigates a shallow stream crossing. “Medicine Lakes,” the trailhead area, is a complete misnomer to this Minnesotan. Shallow puddles of water teeming with invertebrates are not lakes. That said, it IS scenic, and the alpine-y feeling of the place envelops us. We’re in a different ecosystem, a place of fresh wonder. Every flower is new. Chris has climbed a number of fourteeners, but I already know from summiting South Mountain (11,798’) that high altitudes are tough on my lungs. Finding myself energized by the thought of pushing myself to try something I’ve not yet done, I thoughtfully ponder the worst that could happen. It can’t be that bad. Yes, I think I can do this. Crackling campfire and deep conversation give way to restless sleep in which I dream of not being able to catch my breath. Was it the altitude, or could it have had anything to do with someone so dashingly handsome sleeping respectfully a foot away from me? We’ve been paddling for half hour. Wind is rising. This stretch is so beautiful, it should be added to Canyonlands NP. Well before dawn, Bill and I awoke to the earliest light; must’ve been just after five. High winds were expected and we wished to get as far as possible before they arrived with sustained 35-mph force and gusts to 50. That meant hopping into the duckies half hour before sunrise and heading downriver. Eerily, in that canyon I could hear the swooshing of the air currents before I could feel them. It sounded like moving water, without rapids there; all I could infer was that the front was moving in and would be pushing us around. 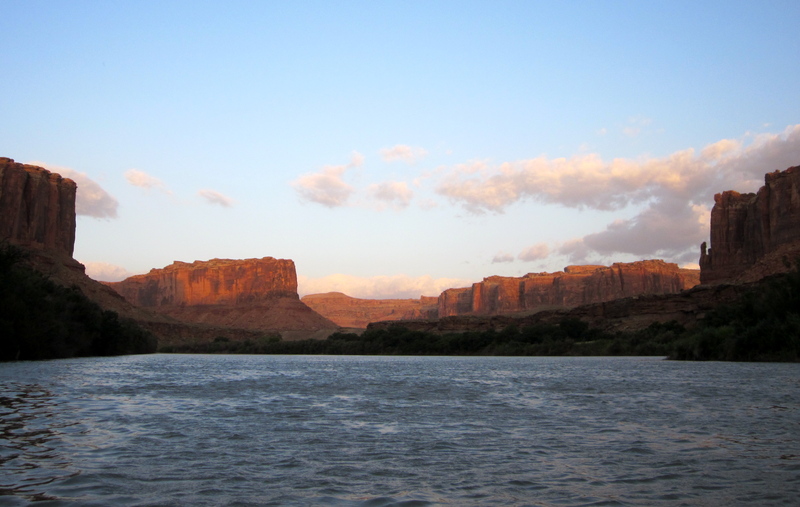 A large bend in the Green River carried me into the plucky up-river breezes that soon became far bigger than I’d hoped. The current barely moved fast enough to carry me downstream without my having to paddle forcefully. This is a far better workout than going to the gym; you know you won’t see your truck again if you don’t push hard and make headway. Motivation is not a problem. A stop at the mouth of Hell Roaring Canyon revealed an exciting 19th-century inscription from the earliest fur trapper to pass this way. 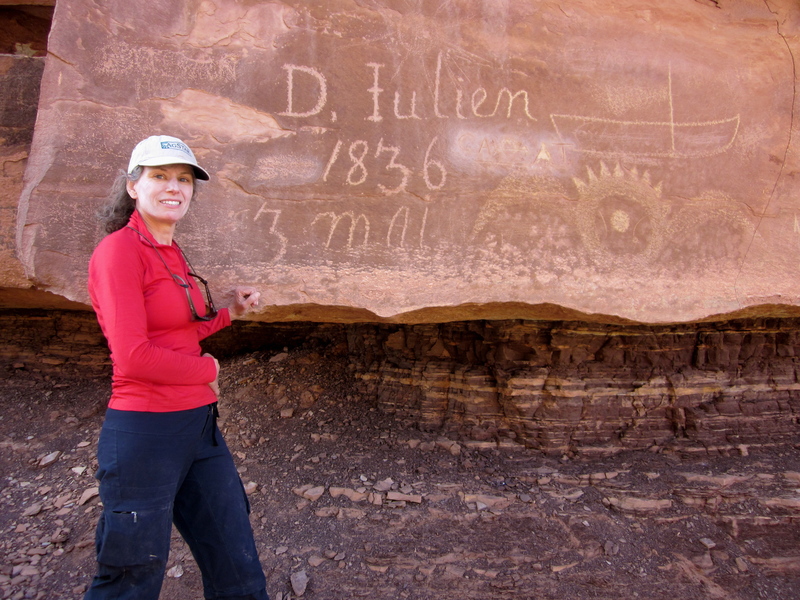 Denis Julien left his name on a number of rocks in the southwest; we know little about him. Still, I stood in the same spot he did, in the same month he did, 172 years later; all the wonders he saw, and the obstacles he overcame, filled my willing thoughts. No inflatable duckie, Clif bars, or Camelbak water carrier for him; Denis did it the hard way. Check out his boat to the right of his name. Utah’s Green River. Today: windless. Tomorrow: watch out. The bow of my inflatable duckie circumscribed lazy spirals like a leaf in a creek; the panorama before me was new every few breaths. On my lap the paddle sat listlessly, waiting to be dipped into the river on rare occasion. I was on the water with our wildlife biologist looking for the endangered Southwestern Willow Flycatcher (SWFL). Last night’s cowboys — who had dismounted, walked their weary horses through the obstacle course of our belongings, and disappeared into the moonlit night — were a gauzy memory. 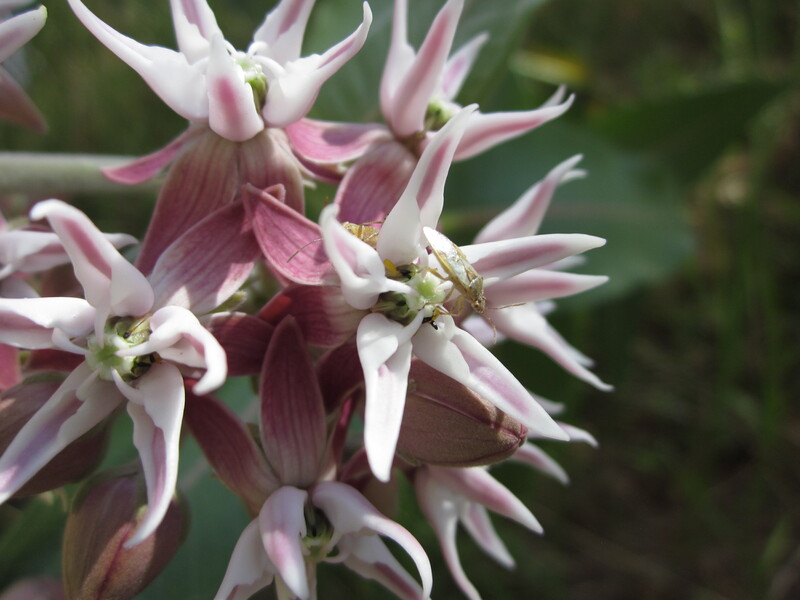 Milkweed in full bloom. Photo by W Sloan. The river’s rhythms now become my rhythms. My only task is to observe. At less than three miles per hour, everything is more visible: a pair of Blue Grosbeaks, new rockfall, a Great Blue Heron fishing stealthily, muskrat slicing the water, peregrine falcon circling overhead, old cottonwoods staking their claim on a bank, beaver chewing on willow. Huge cliffs of Wingate sandstone tower, guardians of the canyon: 600 feet of ancient sand, now lithified, silent, stunning. Breathing slows. Lathered in sunscreen, senses heightened in the wilderness, I reclined in my boat to watch the world go by. When we approached appropriate habitat Bill played a recording of the SWFL song; males would respond to a perceived territorial threat by singing back. Seven times in two mornings on the river we heard it: fitz-bew! It was one of those simple pleasures in life that inserts itself into the heart, an unexpected gift, giving me hope for this species. 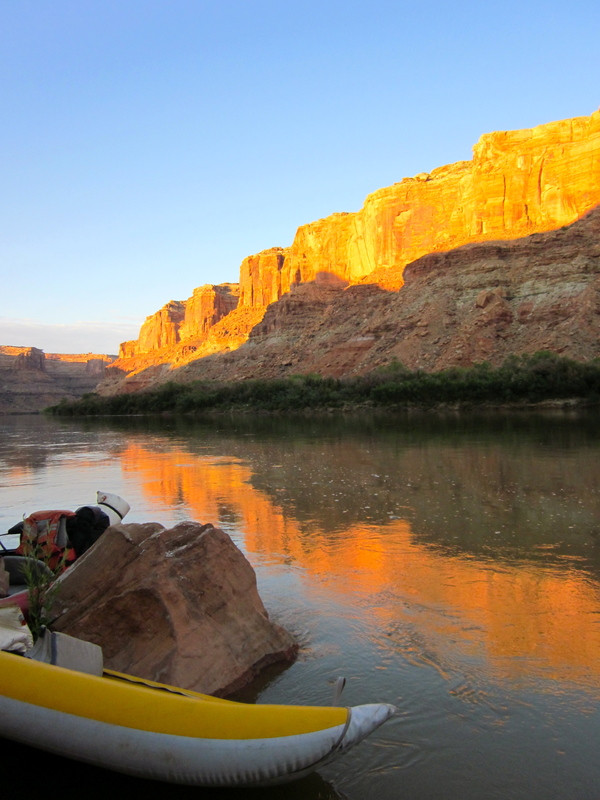 Sunset from our campsite at the mouth of Horseshoe Canyon. Green River meets Barrier Creek. 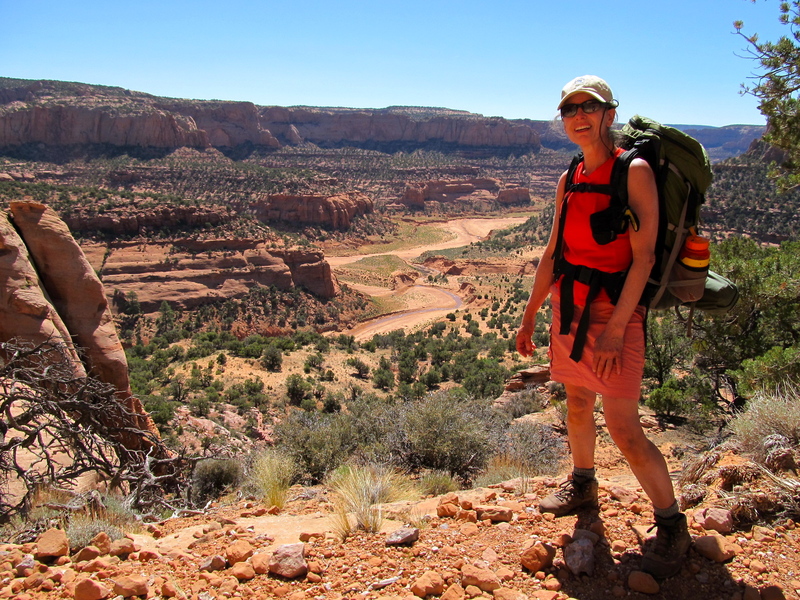 Ranger Kathryn basks in joyful color. Green River. Red Duckie. Dawn. “It’s safest if you drive switchbacks without a seatbelt on.” Bill’s instruction was so counter-intuitive that I shot him a glance that must have said, “Do you think I’m crazy?! ?” We were perched at the top of a thousand vertical feet of winding dirt road taking us down to Mineral Bottom, where we’d leave a shuttle vehicle. I am not overly fond of driving on sandy gashes cut into a cliffside, but I’m willing to push my comfort zone in order to improve my 4WD skills have an adventure. The reasoning behind Bill’s statement was that if one had to exit one’s vehicle quickly (read: truck going over edge) it’s best to not be belted in. I sighed and unbuckled myself, shifted into 4 High, and followed the wildlife biologist’s truck down to the Green River boat launch. 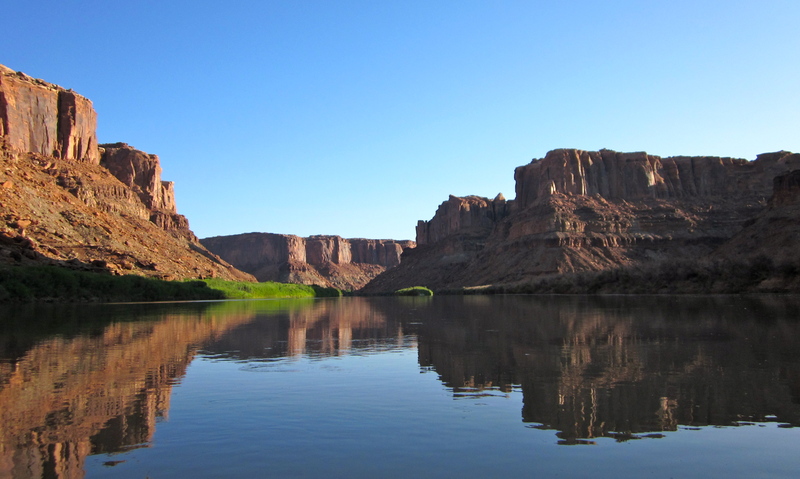 My long-awaited weekend was here; we’d be on the river for two days, surveying critical habitat for the endangered Southwestern Willow Flycatcher. I was beyond excited. If there is one thing this Minnesotan misses in the desert, it’s being on water. After unloading our gear down in Spring Canyon and inflating our two duckies for a dawn start, we crawled into the back of the pick-up to sleep. 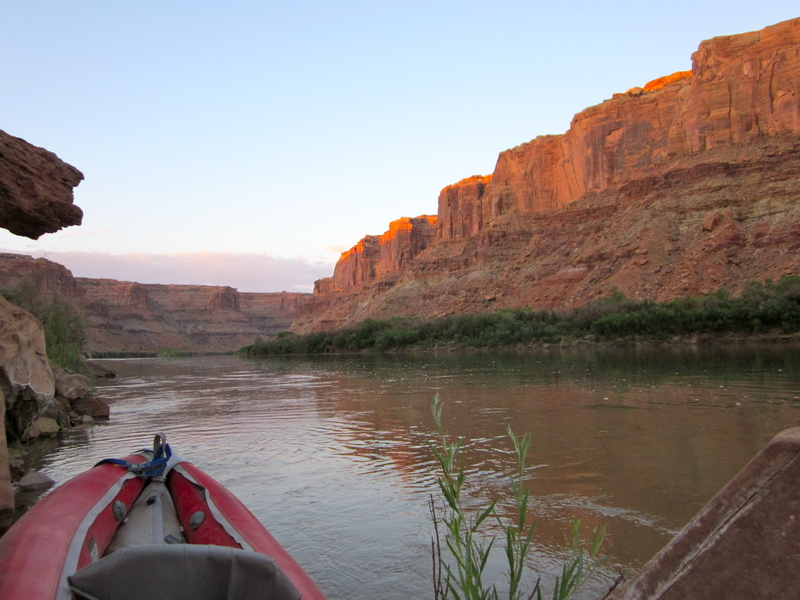 Nobody EVER uses this old track along the Green River and we knew we wouldn’t be in anybody’s way parked on the ‘road’ — boats, cooler, life jackets, dry bags, backpacks, water jugs, and truck. Five minutes into my sleeping bag, I hear a new sound: CLIP CLOP CLIP CLOP “WHOA.” “Easy.” Two of the grimiest cowboys I’ve ever seen were riding by the light of the quarter moon, their path now blocked.